Tyler Gorman/Staff Photographer Senior defender Lauren Cristodero scored her first career goal against UMass Lowell in BU’s first victory of the season. 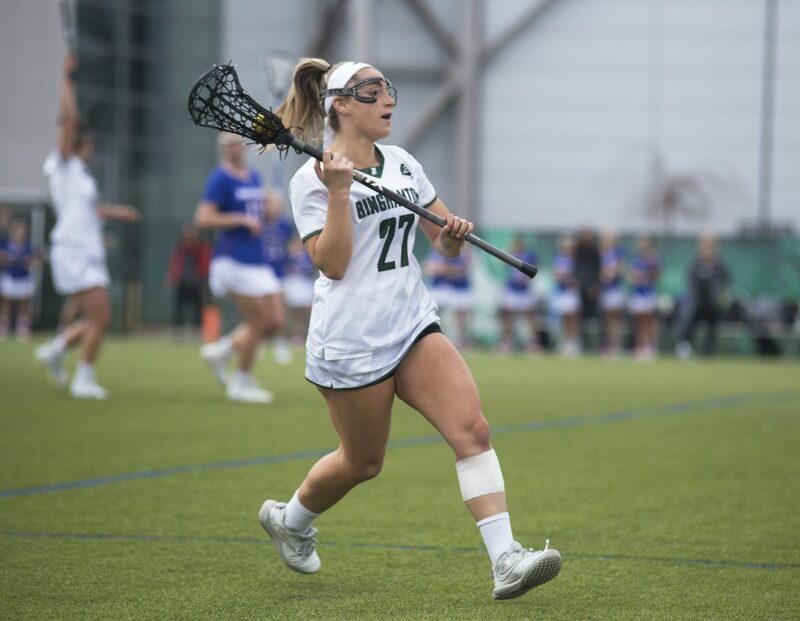 Midway through the second half, the Binghamton women’s lacrosse team was holding a comfortable, four-goal lead over UMass Lowell. Senior defender Lauren Cristodero took a pass from junior goalie Taylor Passuello and charged down the field, passing all of her River Hawk counterparts and scoring her first career goal. The rarity of a defender scoring was one of several thrilling moments for Binghamton, as the team walked off its field Saturday afternoon with a victory. The Bearcats (1-12, 1-3 America East) earned their first win of the season in a 13-7 triumph over the River Hawks (3-10, 0-4 AE). Perhaps the only goal as exciting as Cristodero’s was the first goal of the game, scored by sophomore midfielder Kelly Quinn. Just minutes into the game, Quinn picked up a ground ball near midfield, took hits, dodged defenders and scored while going to the ground, giving the Bearcats a 1-0 lead. This set the tone for the game, as the 1-0 margin soon became a 5-0 advantage in the first quarter of the game. Following Quinn’s goal, BU’s four unanswered goals came from senior attack Olivia Batista, junior midfielder Amelia Biancardi and sophomore midfielder Alyssa Sanchez. After the River Hawks were held scoreless for the first 17 minutes of the game, senior attack Paige MacEachern countered the BU start with back-to-back goals. MacEachern was one of the few bright spots on the day for the River Hawks, scoring four goals in the game. UMass Lowell was able to score the final two goals of the first half and the first two of the second half, cutting Binghamton’s lead to two. After this point, the Bearcats took over, allowing just one goal for the remainder of the game. After scoring once in the first half, Biancardi scored BU’s first two goals of the second half, recording her third hat trick of the season. Biancardi continued her breakout season and is currently tied as BU’s leading scorer. Passuello was a force for the Bearcats, as she has been all season. Recording eight saves in the game, Passuello ranks second in the AE in saves per game and fourth in save percentage. All season, the Bearcats have struggled on draw controls, but the team was able to improve greatly in this area on Saturday. BU had the advantage, winning 16 as opposed to the six taken by UMass Lowell. Next up for BU is a home game against Hartford. The Hawks (1-13, 0-4 AE) are in just their second year of Division I play, and have won just two games in two years, with none coming against conference opponents. The matchup should provide a strong opportunity for Binghamton to build more confidence as it looks to make a push late in the season. First draw against Hartford is set for 4 p.m. on Saturday, April 13 at the Bearcats Sports Complex in Vestal, New York.